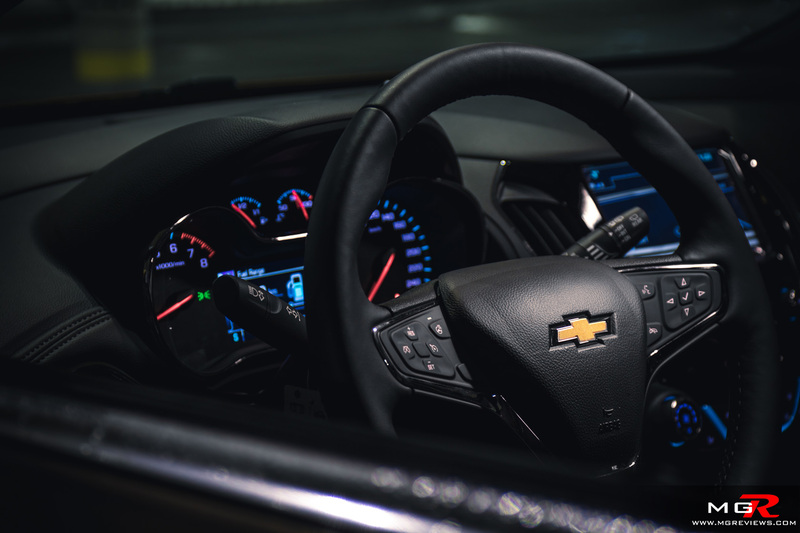 The Chevrolet Cruze is quickly becoming one of the most popular compact sedans in the market due to its efficient engine, stylish looks, and relatively inexpensive pricing. 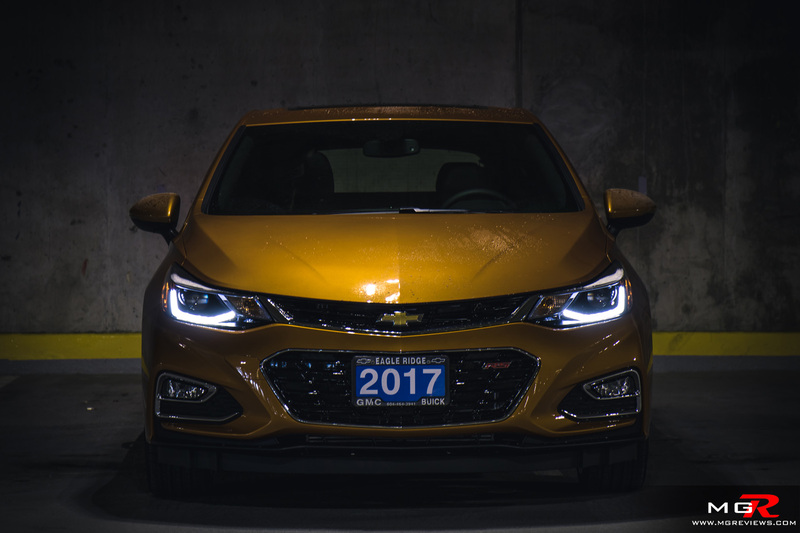 For 2017, Chevrolet introduced the Cruze with a Hatchback variant that is set to take on the Mazda 3, Honda Civic, Ford Focus, and Toyota Corolla hatchback versions of their respective makes. 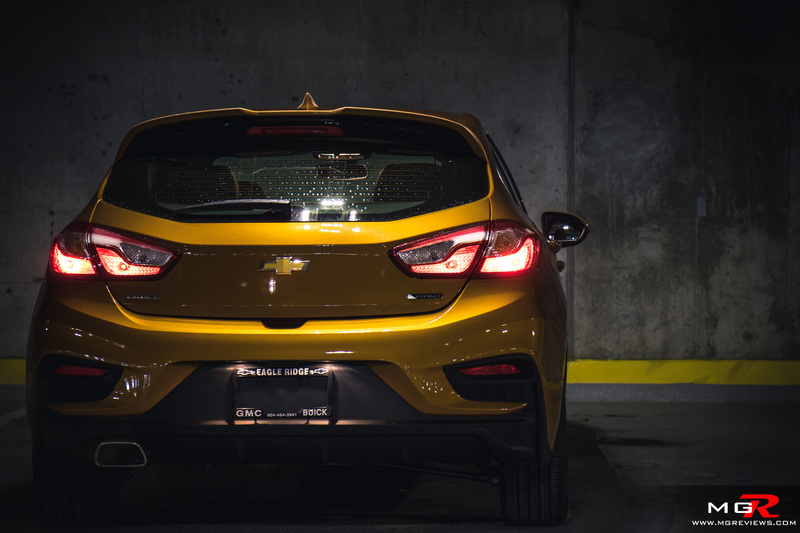 Performance – The Chevrolet Cruze hatchback is only offered with one engine choice. 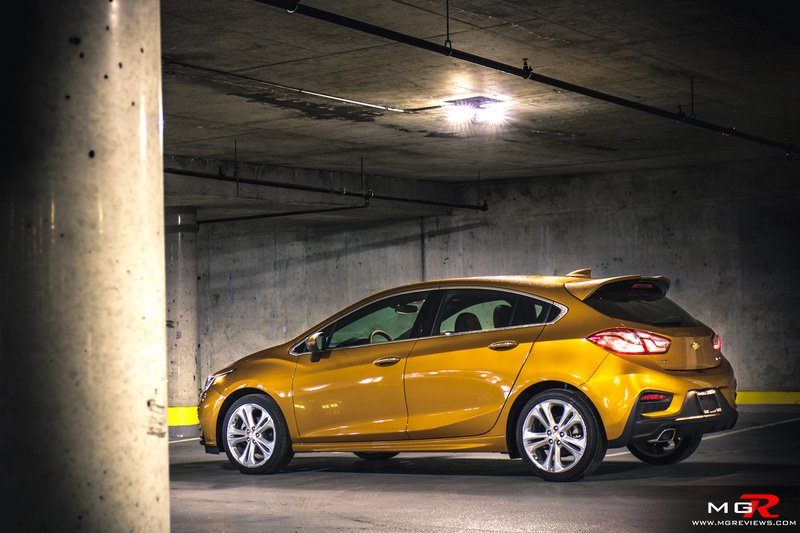 A 1.4L turbocharged 4-cylinder does the work of moving the hatchback. The engine develops 153 horsepower and 177 lb-ft of torque that gets sent to the front wheels via a 6-speed manual or 6-speed automatic. 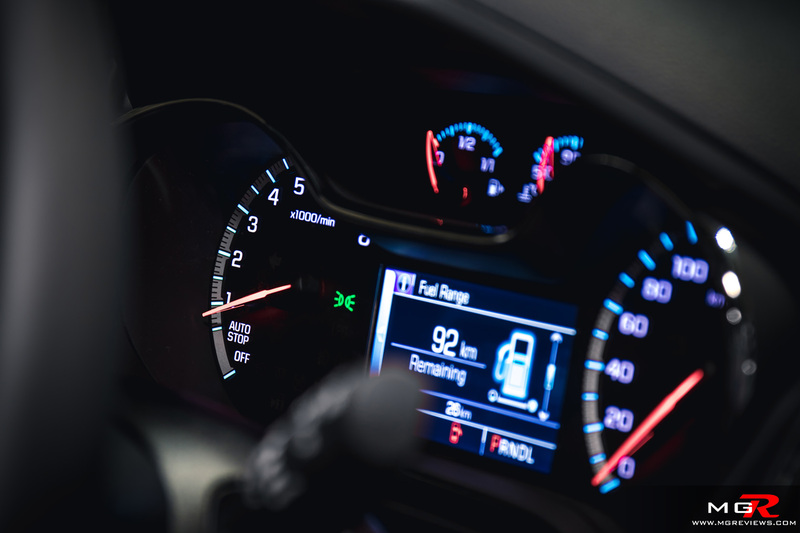 While on paper the power figures fall in line with the competition, in reality the Cruze is not quite as fast as one would expect. In fact, it is one of the slowest compact hatchbacks in the segment with a 0-100 km/h time of approximately 7.6 seconds. Not exactly a hot-hatch-ish type of time when the competition is 0.3 to 1.1 seconds faster to 100 km/h. But where the Cruze does have an advantage over the competition is in fuel economy. 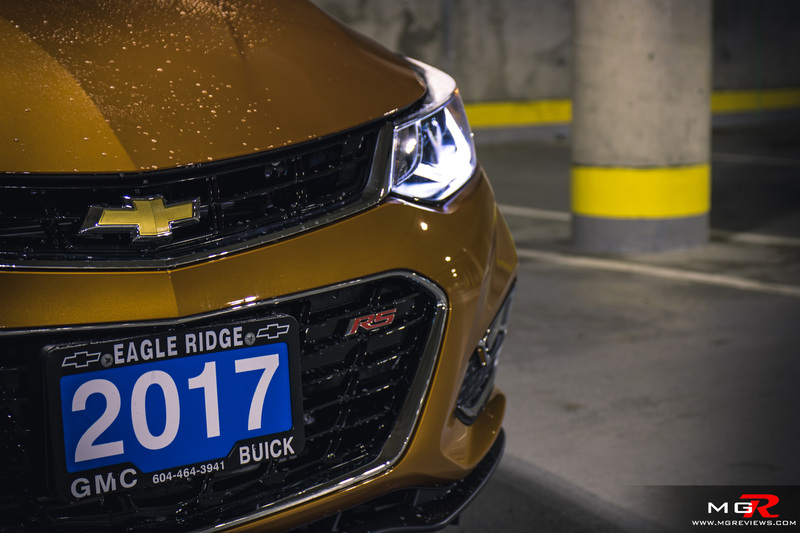 In a city the Chevy Cruze can achieve a fuel efficiency rating of 8.1 L/100km and that number improves to 6.2 L/100km when you’re on a highway. 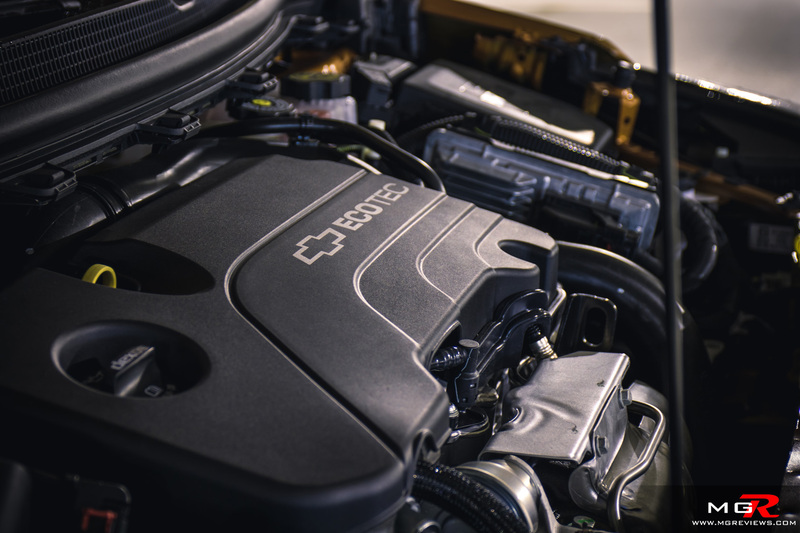 The Cruze doesn’t use any sort of hybrid technology or witchcraft just proven and refined technology like direct injection, turbocharging, a start/stop feature, and an aerodynamic exterior. Speaking of which, the start/stop feature in this Chevrolet Cruze hatchback is one of the least intrusive out of any other vehicle model on the market. The time it takes you to move your foot off the brake pedal and onto the gas pedal is more than enough time for the car’s computer to turn the engine back on and be ready to accelerate the car without any delay. It is also smart enough to know when you’re in heavy traffic because after an initial engine shut off, it will not shut it off again if you slowly creep forward and stop and keep repeating. Unfortunately the system cannot be shut off at all. 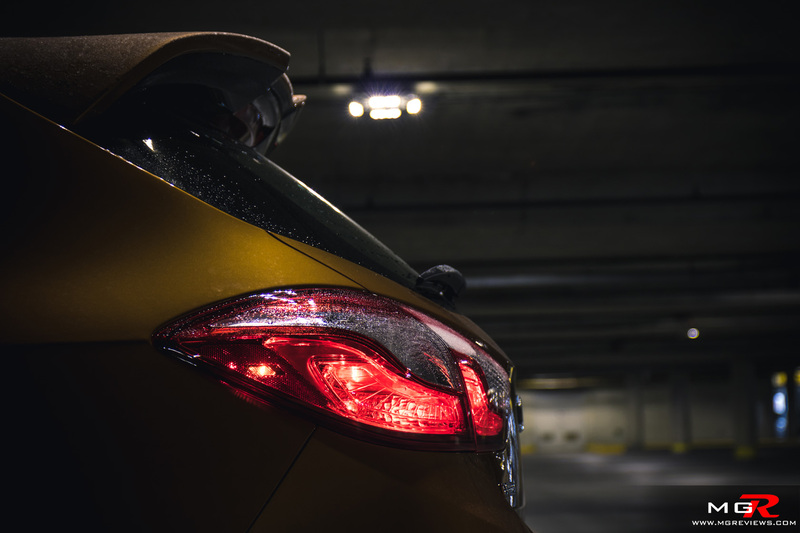 Comfort – However when you are at a stop light with the engine shut off, you can appreciate the quietness of the Cruze Hatchback. 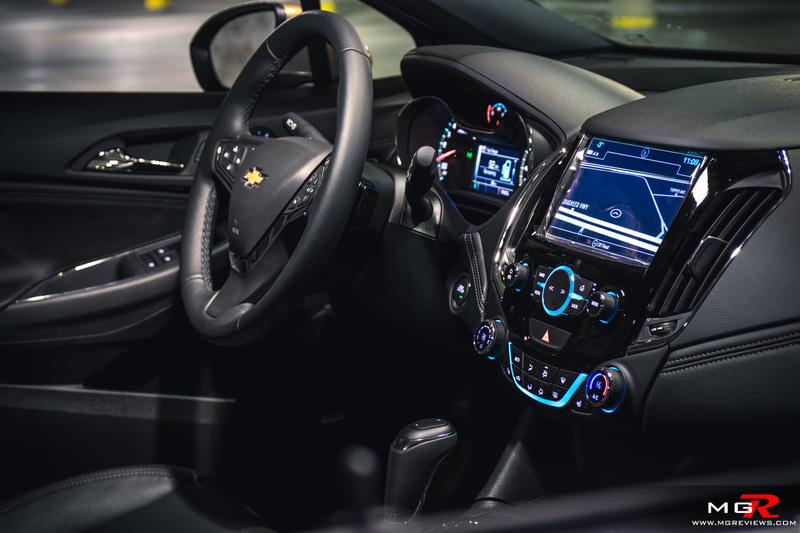 Chevrolet’s engineers spent a lot of time refining the latest generation Cruze and it shows in the quietness of the cabin. 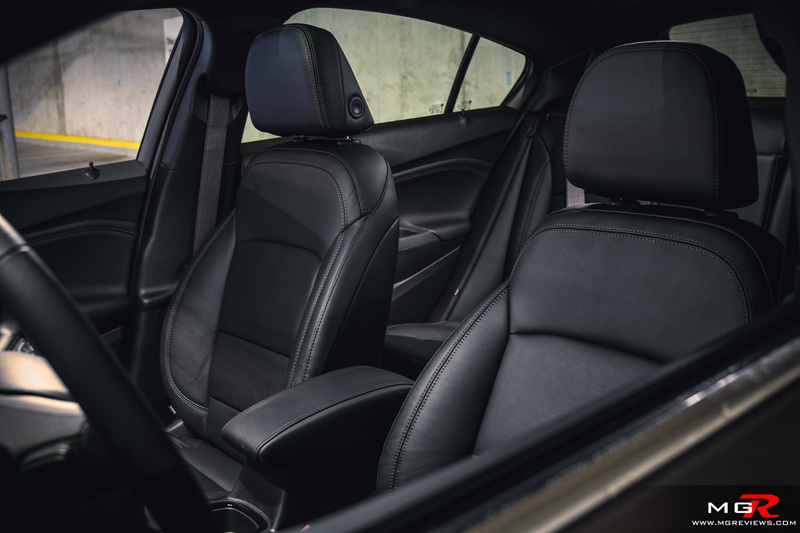 Sound absorbing materials have been added throughout the cabin as well as in the wheel wells to reduce exterior noises from intruding into the cabin. As a result, the Chevy Cruze Hatchback’s interior noise levels are better than most at just 69 dBA at 70 mph (113 km/h). Not only is the interior very quiet but it is also nicely designed and a major improvement over the previous generation. The dashboard is covered in soft touch materials and features unusually artistic designs (for an entry level compact hatchback). 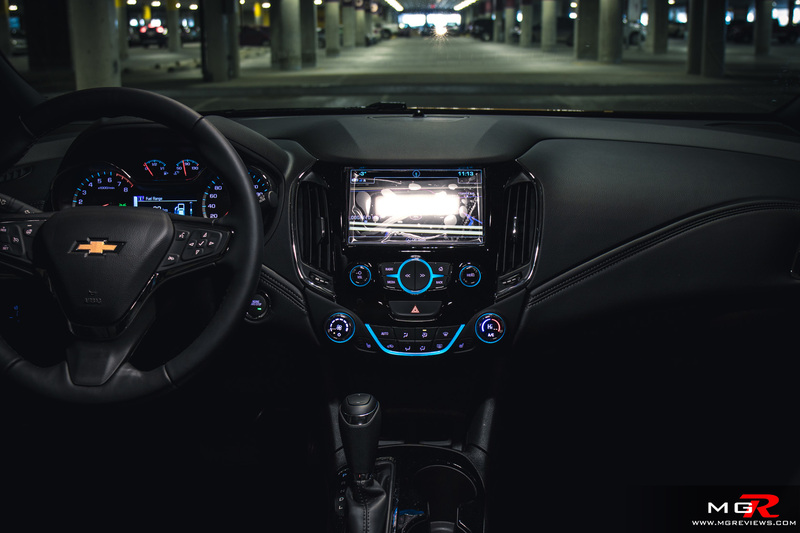 The center of the dash is accented by the 8-inch color touchscreen and the only physical buttons are those that you would use most often such as heater controls, stereo volume, a home button, and heated seats. The steering wheel on the other hand is covered in buttons but it doesn’t feel as cluttered as on a Kia Optima for example. One really nice feature, and somewhat of an overlooked feature during the darker winter months, is the knob for the automatic headlights. The default “automatic” position is always selected and if you do turn the knob to the left to turn them off, it will spring back into the “automatic” position like a dead man switch. 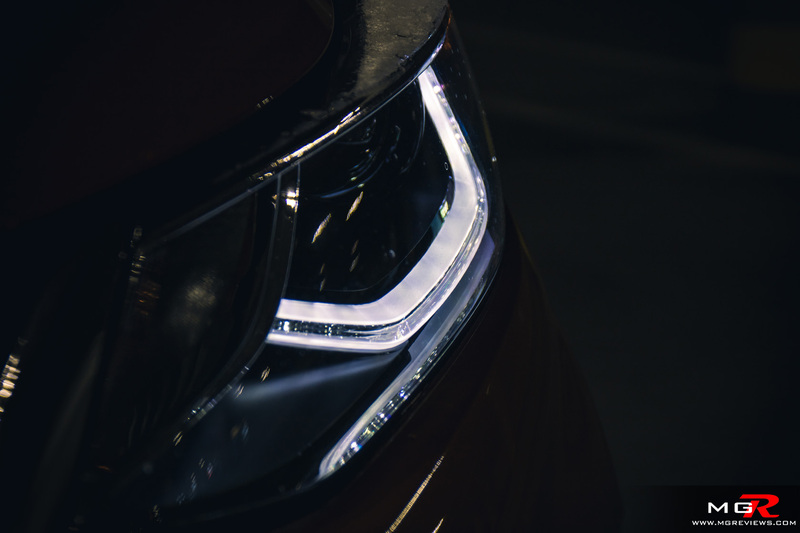 So regardless of whether or not you forget to turn on your headlights and taillights when it gets dark, they will turn themselves on and you will not be one of those drivers that will be driving around in the dark with no taillights and relying only on the daytime running lights. Interior space is plentiful for the front occupants. Optional power seats provide the optimal position for anyone’s stature and in the back, the 60/40 split folding seats provide a segment leading 1,337L of cargo or an adequate amount of room for 3 regular sized adults. 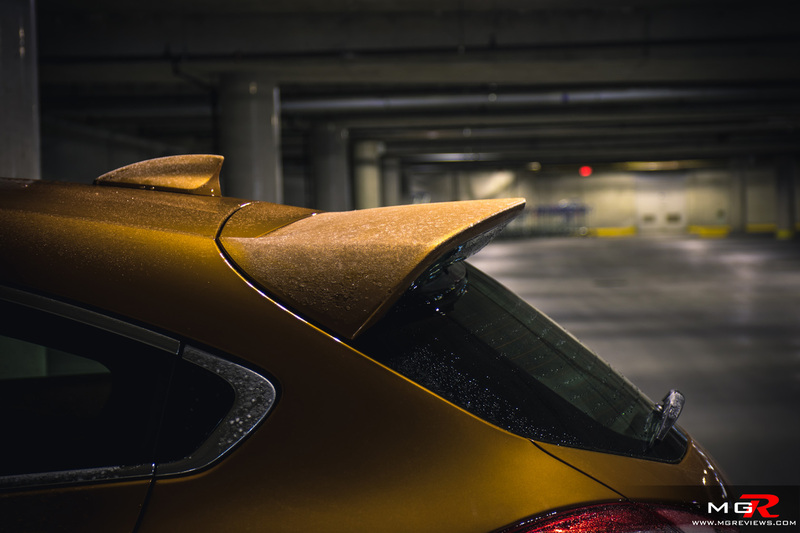 Taller people will find their hair rubbing against the roof in the rear seats due to the stylish sloping roofline. 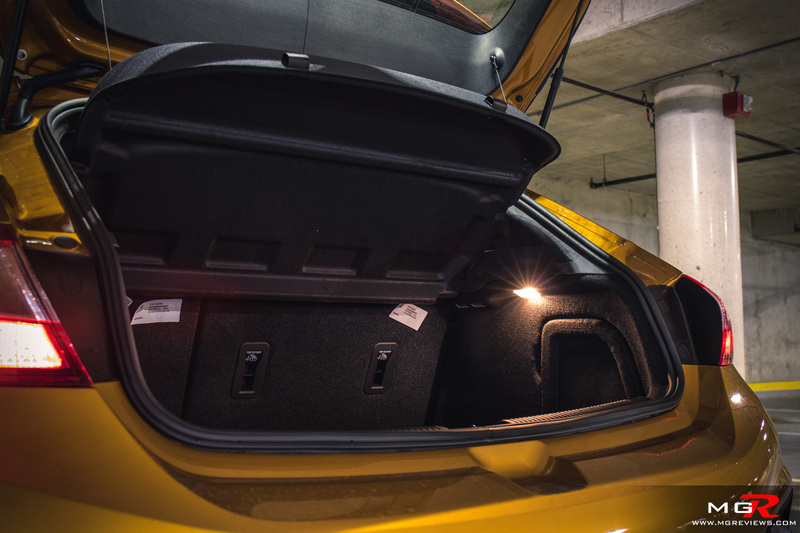 Odds and Ends – Compact entry level sedans and hatchbacks try to please everyone’s needs when they’re looking for a vehicle. Some want comfort, others want driving fun, most want fuel economy and gadgets. So auto manufacturers try to find a balance between all of these features and characteristics but some put more emphasis on certain traits than others. 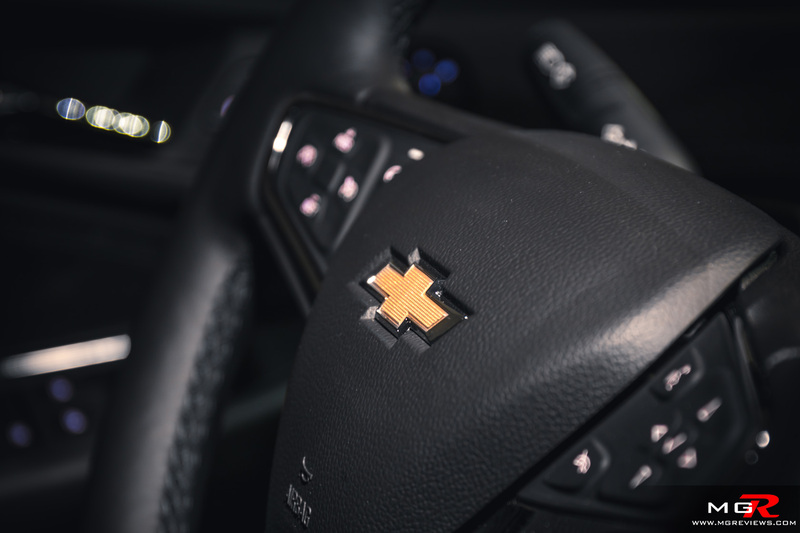 Chevrolet’s emphasis is primarily on fuel economy, refinement, and technology. 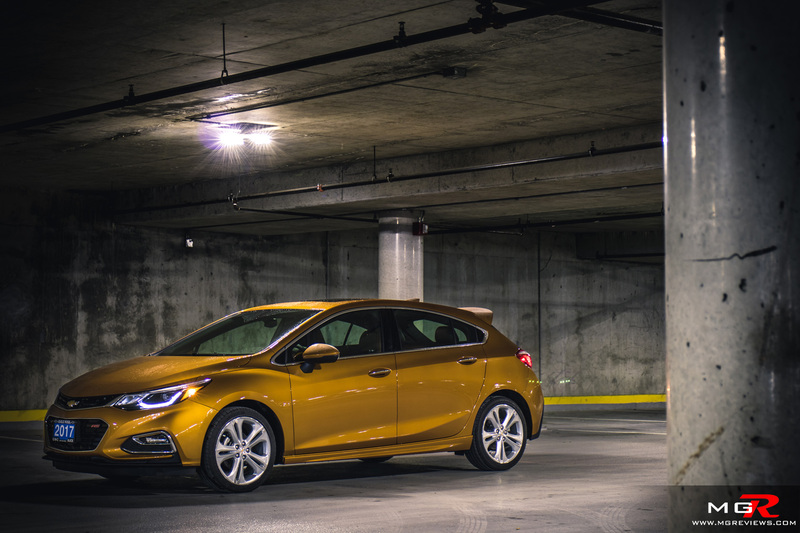 Although the Cruze Hatchback starts at just under $21,000 CAD, it does come with a lot of stuff as standard features. Alloy wheels, heated seats, backup camera, Apple CarPlay and AndroidAuto, 10 airbags, and a 7-inch color touchscreen with satellite radio (optional is the 8-inch display). And I haven’t even mentioned the fact that you can remotely start, lock and unlock, or sound the horn from anywhere in the world thanks to the OnStar app. And there’s also 4G LTE with Wifi as standard that lets your passengers surf the internet on their phones or tablets while on a long and boring road trip. 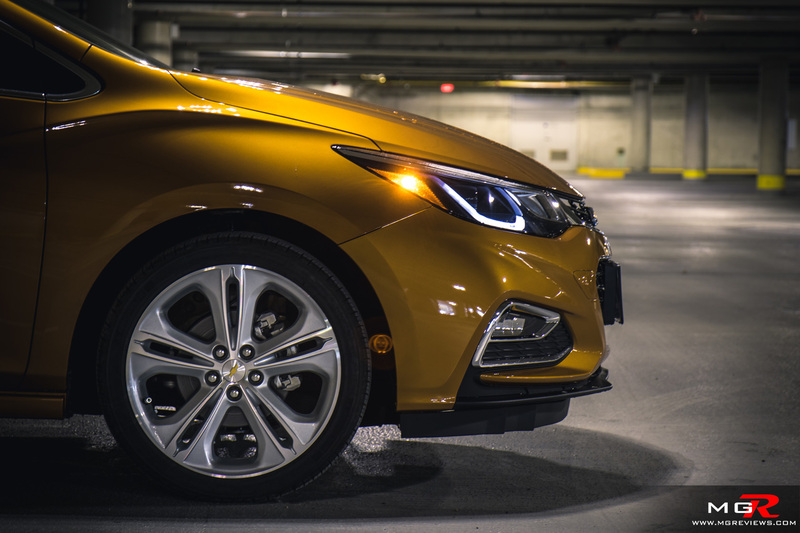 But the Cruze Hatchback can be further kitted out with tech that is designed to prevent you from getting into an accident in the first place. Forward Collision Alert detects slow moving or stopped vehicles in front of you and will sound an alert for you to take evasive action. Rear Cross Traffic Alert detects vehicles or pedestrians that may cross behind you as you’re backing out of a parking stall for instance. And finally Blind Zone Alert and Lane Keep Assist are pretty self explanatory. 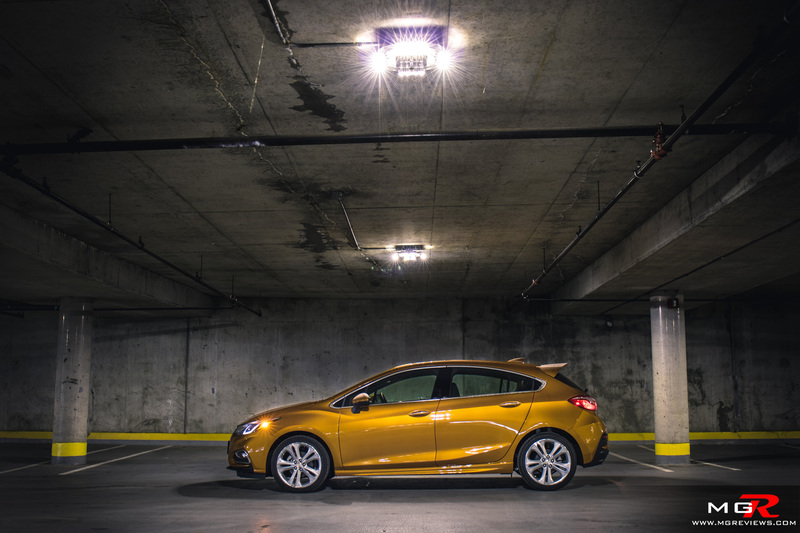 A fully loaded Chevrolet Cruze Hatchback will set you back $30,500 CAD, including freight and A/C tax. But the base LT trim at just under $21,000 is fitted with everything that the average consumer may want from a daily commuter vehicle that is inexpensive to insure, great on gas, quiet, and safe for the family.